NAIROBI: Kenyan security forces yesterday resumed their search of the hotel complex attacked by Islamists with sniffer dogs and bomb experts, as information emerged about one of the attackers who killed 21 people. A police source, speaking on condition of anonymity, said they were confident there were no more people trapped inside the hotel or surrounding office buildings after the 20-hour assault, during which some 700 civilians were rescued. “We are confident that we have no more people there,” the officer said, “but in a situation like this, you are not done until you are done.” “We are back in with sniffer dogs and bomb experts are checking through because yesterday we found grenades left by those people.” Police warned the public there may be loud controlled explosions as they continued their sweep of the hotel. Five gunmen with the Al-Qaeda-linked Somali militant group Al-Shabaab attacked the DusitD2 hotel and office complex on Tuesday afternoon. Chilling CCTV footage showed one of the attackers lingering in front of the terrace of the Secret Garden restaurant before blowing himself up. Four other attackers were shot dead by police during the operation to secure the hotel. Al-Shabaab said it was acting to avenge the decision by US President Donald Trump to declare Jerusalem as Israel’s capital, according to the SITE monitoring group. Police say one of the attackers was Ali Salim Gichunge, who was also known as Farouk. 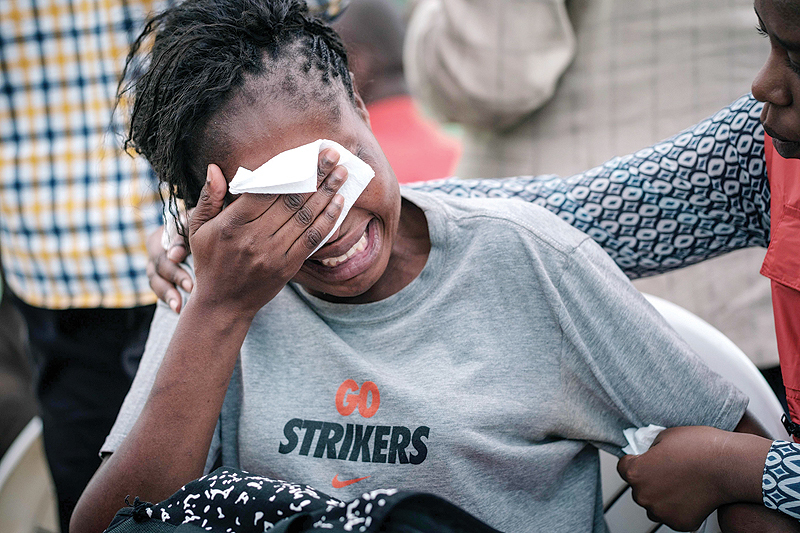 He was traced through his car, which was used at the attack, to his home in the Ruaka suburb where he lived with a woman in her twenties named Violet Kemunto Omwoyo. “We are interrogating her to know more about the attack because she is not innocent,” according to a detective who took part in the raid on their house. He said police had uncovered a “huge hole dug in one of the rooms where guns were stored.” “Neighbors have told us the couple was planning to move out because they had even put up their items for sale through the community’s social network.” The Standard newspaper said Omwoyo had written: “We are moving out of Nairobi this week” on her ad selling clothes and furniture. Among the victims who died in the attack were two ethnic Somali Kenyans who worked on a project called the Somalia Stability Fund, a Kenyan football blogger and a policeman responding to the scene. An American working for a consulting and investment firm, who survived the 9/11 attacks in the United States, and a dual British-South African development worker were also among those killed. As the attack unfolded, scores of terrified civilians barricaded themselves inside toilets and offices for hours. Some were killed at the Secret Garden restaurant, while another six bodies were found on the third floor of the hotel, where one of the gunbattles took place. The Red Cross said that 19 people reported missing to them, had since been traced. Several private citizens and foreign security forces took part in the rescue operation. British media reports said a former special forces soldier who was out shopping when the attack happened, jumped in to help Kenyan special forces. Kenya’s Daily Nation newspaper hailed the “sweet victory over terrorism” as praise poured in for the swift and professional response from security services. This stood in stark contrast to the scorn heaped on disorganized police and army officers who staged a chaotic intervention when Shabaab attacked the Westgate mall in 2013, leaving 67 dead. “There was a sense of triumph despite adversity,” read the newspaper’s editorial.